The weather today was very sunny and the whole family is red. The humidity wasn’t very high today but the sun was intense. We went in the pool and it has about 99 per cent salt and one per cent water!!! We watched a documentary film on “SS Northern Star” and how she was built. Mandy and I had a smashing game of deck tennis and then we giggled at a crowd of women playing cricket. The night before this we watched Burke’s Law and it was on till very late, and the following morning (29th) I was so tired that I missed breakfast! We anchored off Rarotonga (Torrid Zone, near Cook Islands) and some hula hula girls (and boys) rowed out and gave us a show on the Games Deck. Mummy thought they were plastic flowers but they were all real, and the scent was overpowering. In the end they danced with some of the audience – Mandy got picked as well! They were giving their lays away and one man had hundreds but we couldn’t reach him. At 7.30 I went with the scoutmaster to the pool to learn life saving. I expected – so did Bob – lots of people there, but instead one other person turned up! There is no proper date today, it’s just a leftover day. This week the days go Monday, Antipodes, Tuesday, Wednesday etc, so there are eight days in this week. In the morning the weather was pretty grim, but in the afternoon we went in the pool. I learnt how to tie: reef knot, clove hitch, round turn and two half hitches and bowline in Scouts and I whipped the cabin trunk rope. Today when we (Mandy and I) went out to see what the weather was like, we had an unpleasant surprise. Instead of the weather being sunny like yesterday’s it was raining, the sky was overcast and the sea was fierce. When I looked at Today’s Programme it said that “Lawrence of Arabia” was on in the afternoon. I went in to see it, but I discovered that seeing a film twice spoils it. Mum wasn’t feeling well today so she stayed in bed all morning, but she got up in the afternoon. I went to Scouts but we didn’t do anything. We’re going to life save and water polo during the week. The weather warmed up a lot today and all the passengers were on Sun Deck. Mandy and I went in the ship’s pool, it was cold, but not as much as our last quick dip. We stayed in about 30 to 40 minutes – an improvement on last time’s two to three minutes. There was an emergency drill today, and we all think the ship would have sunk before we reached our station. The nearest land is Great Barrier Island. Today we visited St Heliers Bay, to see if it was as nice as Sydney. It was all right, but I’d rather have Sydney. It had very white seagulls with scarlet legs. After we had given our hired Mini in, we changed our New Zealand for English. It was all very complicated but at last we were able to get away. 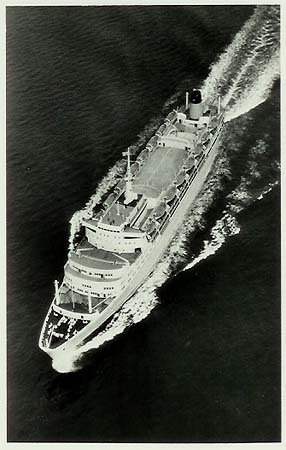 Upon reaching the dock we found that the ship was one hour late, because of rough seas. Then Daddy went to the customs officer, and he said it was one and a half hours late!!! After one-and-a-half hours waiting she finally swept majestically into port. It was still raining today non-stop. 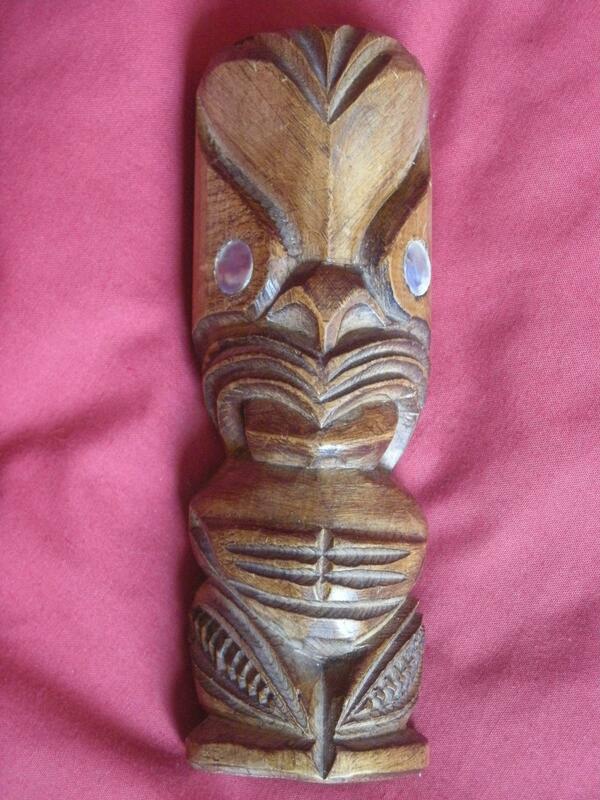 I saw a lovely Maori god in a Maori carver’s shop: 25 shillings, and we saw him (the carver) making it. After looking round the shops I decided to buy him (the god) he is Rongo, god of peace and plenty. Next to went to the Model Village, everything (well, nearly everything) made out of wood is lavishly carved. Even a bird box was carved all over. Then we went into the thermal area. There were clouds of steam rising from the ground from potholes, and boiling mud. The stink was worse than Solfatara. We passed a geyser and it was spurting boiling water into the river. We also saw a Maori cooking pool which looked like a tiny volcano crater with boiling water in it. The mud pools were fascinating to watch, making lovely shapes each time they bubbled. After breakfast we went out to the car. It was pouring heavily. We crossed the mountains in pouring rain on terrible roads. When we got to Wiatomo caves the lady said we would have to wait one hour and it takes one hour to go through so we didn’t go. The first flats Daddy went to in Rotorua we got. It was geyser heated and it had a hot thermal pool as well. That night we went to Geyser Land (a motel) to see a Maori concert. A boy kept on doing a “haka” (sticking their tongues out and opening their eyes wide). One girl was swinging a double long poi concentrically. Today we landed in Wellington, the capital of New Zealand. We passed Customs and went to the bank and changed some sterling to New Zealand. Daddy saw a Hertz rental car desk, so we rented a Mini and set off for New Plymouth. The countryside is different – hills left right and centre with narrow ledges (made by sheep I think). The sheep here look like ones out of babies’ rag books, with clean white wool. There was one cloud that looked awfully like a snow-capped mountain, so mummy looked on the map to see if there was one in that area, and it was Mount Egmont! As it got darker the peak started to go negative, it looked beaut. At last we found a motel, and I slept like a dead log. In the morning we woke up very early and had breakfast. There was an ancient radio in the flat about as big as a fridge!